With the parties dug in, what will happen with budget talks now? 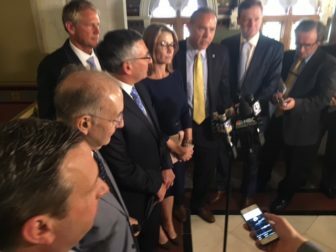 Legislative leaders addressed reporters after a budget meeting with the governor last month. From left, Sens. Bob Duff, Martin Looney, Len Fasano and Kevin Witkos and Reps. Themis Klarides, Joe Aresimowicz and Matt Ritter. With the regular General Assembly session over, and a budgetary nightmare just 23 days away, Gov. Dannel P. Malloy and legislative leaders no longer can avoid one huge question. Should they continue with bipartisan budget talks, or is it time for Democrats and Republicans to go their separate ways? Neither the administration nor top lawmakers mapped out a path Wednesday to a bipartisan solution to the $5.1 billion deficit plaguing the next two-year budget. More importantly, both sides acknowledged they have dug in along partisan lines on an issue that doesn’t appear to accommodate middle ground: reducing labor costs. “I hope that we can agree to something, but there certainly are lines in the sand and that is our line in the sand,” House Minority Leader Themis Klarides, R-Derby, said. Officials have known since last November’s elections that the political numbers would be tight. Republican gains left the Senate split 18-18 and Democrats with a narrow 79-72 edge in the House. What they didn’t know was that an already daunting deficit forecast would grow much worse because of eroding income tax receipts. State finances, unless adjusted, will run as much as $2.3 billion in deficit next fiscal year and $2.8 billion in 2018-19, potential shortfalls of 12 and 14 percent, respectively. The deficit in the second year is larger than the value of the tax hikes Malloy and legislators ordered in 2011 and 2015 combined. And while every budget proposal offered to close those deficits includes tax hikes, all officials say they want to minimize taxes as much as possible. The linchpin in every plan? Labor savings. After six months of talks with union leaders, Malloy announced a tentative concessions framework that would save $701 million in the first year and $869 million in the second. In return, though, Connecticut must extend its benefits program with state employees — pensions, retirement health care and other benefits — from 2022 to 2027. That’s particularly controversial given that Connecticut still doesn’t save enough to cover all costs of the benefits it offers. The state currently sets aside less than one-quarter of the funds it should annually to cover the retirement health care promised to present-day workers. That should climb to about 57 percent per year under the concessions deal. 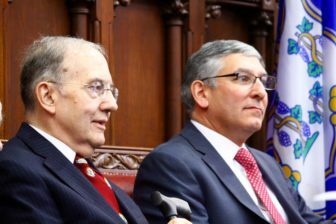 But that still means future taxpayers must cover the rest of that cost, and critics say these types of poor savings habits are what led to the spiking retirement benefit costs Connecticut faces today. The state also struck a deal with unions last January to shift $14 billion to $21 billion in pension contributions owed over the next 15 years until after 2032. Malloy says this is the best Connecticut can make of the bad situation it inherited from previous governors and legislatures. Klarides and Senate Republican leader Len Fasano of North Haven say it’s not. Their alternative is to begin legislating changes to state labor laws now — suspending contract arbitration and eliminating overtime — and reducing benefits after the current contract expires in 2022. Or, Republicans say, the governor could tear up the tentative deal, go back to the unions and ask for even bigger concessions. Democrats counter that those options are laughable while the deal is pending. They haven’t said what they would do if union members reject the deal. Reneging on a negotiated deal or moving legislation to restrict collective bargaining would harden rank-and-file union members against ratifying any givebacks. The Republican budget was tabled after a two-hour debate. “I certainly understand the governor’s position as an honest broker,” Fasano said. Aresimowicz said he would always maintain communications with the GOP, but Republicans would effectively remove themselves from the process if they keep insisting on re-writing labor laws before unions can even vote on the concessions deal. Fasano said House and Senate Democrats’ budget concepts didn’t spell out specific spending in each line item and left big question marks, such as a $200 million undefined cut in municipal grants. Fasano added that the governor, at least, produced a complete budget plan, unlike Democratic lawmakers. “You can’t negotiate with a ghost,” he said. So where does that leave bipartisan budget talks? Democrats say drop the collective bargaining changes. Republicans say no — unless the unions will give more. 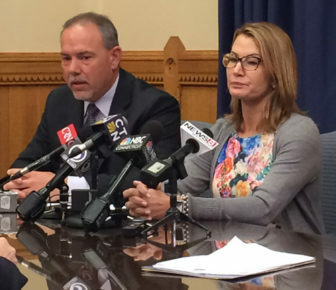 And what of the governor, who has the unenviable task of trying to run Connecticut under severe fiscal restraints if there is no new budget in place by July 1? Under that scenario, state law requires the governor to operate the state under the previous fiscal year’s budget. That is far worse than it sounds. While the bottom line on spending does not change, contractually obligated increases in pension contributions, other retirement benefit costs, debt service and Medicaid alone will cost an extra $950 million next fiscal year. And on the other side of the ledger, analysts say the current revenue system will produce $800 million less in 2017-18 than the level assumed when the outgoing budget was adopted last spring. That means the governor faces a fixed bottom line, at least $950 million more in fixed costs and $800 million less in revenue. The combined $1.75 billion squeeze is expected to delay or force cutbacks in payments to community-based social service agencies, aid to municipalities and other various other programs.